The One Planet Council has run a series of events for planning professionals on both OPD plots and in-house at Local Planning Authority venues. 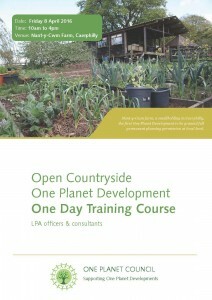 The Open Countryside One Planet Development CPD One Day Training Course has received 100% positive feedback by those involved in assessing applications throughout Wales. View previous LPA training programme and booking form. The team delivering the course has included James Shorten, the principal author of the OPD practice guide; Dr Erica Thompson, OPD householder, climate scientist and secretary of the One Planet Council; Bill Knight, Ecological Footprinting expert who put together the footprinting tool which accompanies the guidance ; Mark Waghorn, an experienced eco-architect based in Wales, covering Zero Carbon Buildings. The guidance is necessarily complex, and deals with aspects of development not found in other types of planning proposals. However, at the end of the day both applicants and planners should be confident that they know what OCOPD is, what is required of planning proposals for it, and how to assess the authenticity and integrity of OCOPD planning applications. For anyone with an interest in sustainable land based living this is an opportunity not to be missed. In-house training can be organised through the One Planet Council. CPD certificates will be issued on the day.